One way to organize and setup these components is to follow the “Structure should follow strategy” mantra. Look at what the strategy is, and design the previous components accordingly. 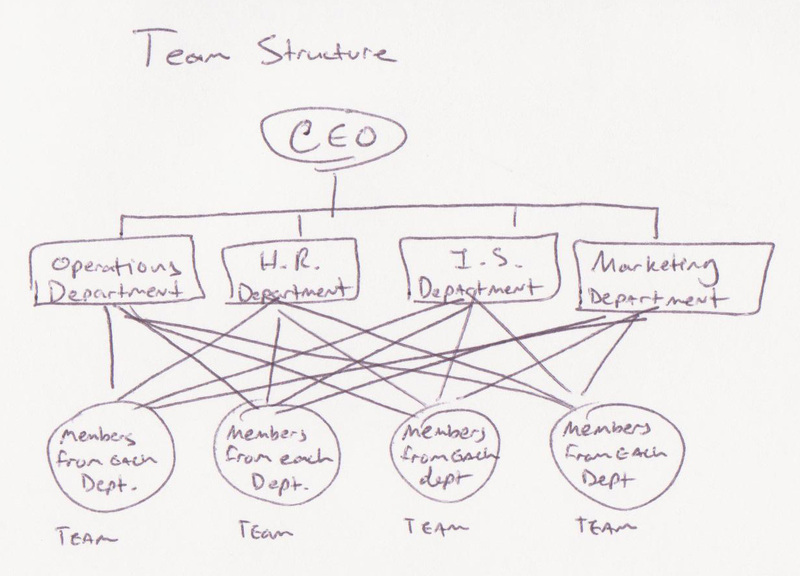 When many people think of organizational design, they think of the structure component (the “org chart”). This may be due to the difficulty in thinking through many of the organizational design components. Instead of customizing the level of each component to a strategy, many people use a canned or popular default organizational structure. 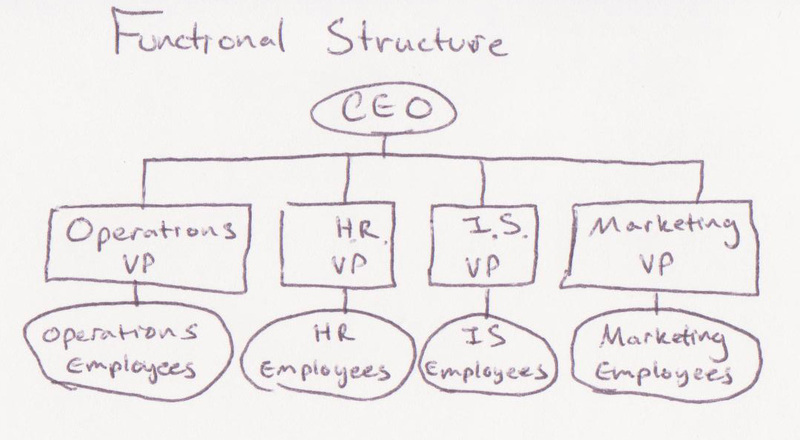 Default structures help determine how organizational components are designed. 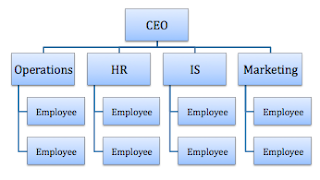 Before describing popular organizational structures, it should be noted that all organizational structures can fall within a spectrum. One end of this spectrum is labeled ‘Mechanistic’, and the other end is labeled ‘Organic’. Mechanistic organizations are considered to be closed to their environment because they cannot adapt or deal with complexity. Organic organizations on the other hand, are considered to be open to their environments because they can adapt and deal with complexity. Mechanistic structures are the most common because the first enterprises were patterned after the Army which had a very strict chain of command. Here is where each of the following default structures lie on the mechanistic-organic spectrum. This is generally used by small businesses or startups. Although they can be quick to respond, adaptations come in small iterations. They cannot handle complexity and usually bottleneck when coordinating with ‘the boss’. This form organizes people based on their skills. 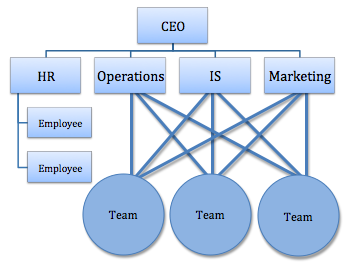 It can deal with more complexity than simple organizations because of the specialization groups that employees are in. Each department however, has a hard time seeing the big picture which involves the other departments and their concerns. Processes are usually required to facilitate or force coordination between departments. This is generally the most common. This structure promotes centralization. A conglomerate is a set of unrelated businesses and based on departmentalization. Each of these businesses could be further categorized. Instead of creating departments based on skill, departments are created based on geographical regions, customer groups, or product groups. Customer needs can be better met with this type of structure. 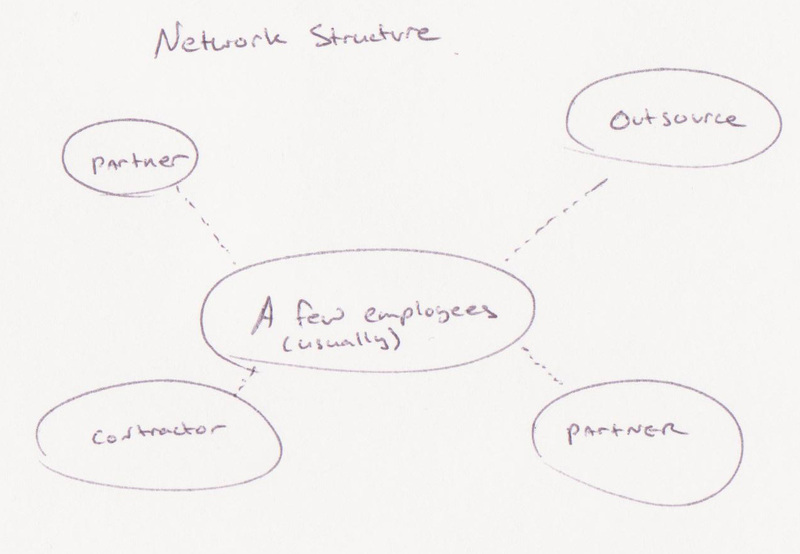 Divisional structures are scalable and do not force employees to specialize. Administrative costs rise because each department could be a miniature functional company. Divisional structures can adapt and deal with complexity better than functional structures because a divide and conquer approach is present. These organizations start sharing resources. A matrix structure tries to get the best of both worlds by superimposing a functional structure on top of a divisional structure. High levels of communication and coordination are present, but this comes at a higher cost. Less time is spent supervising, but decisions may take longer because consensus from a diverse group will be harder to achieve.There are also usually two bosses which can cause confusion. This structure takes full advantage of its human resources. 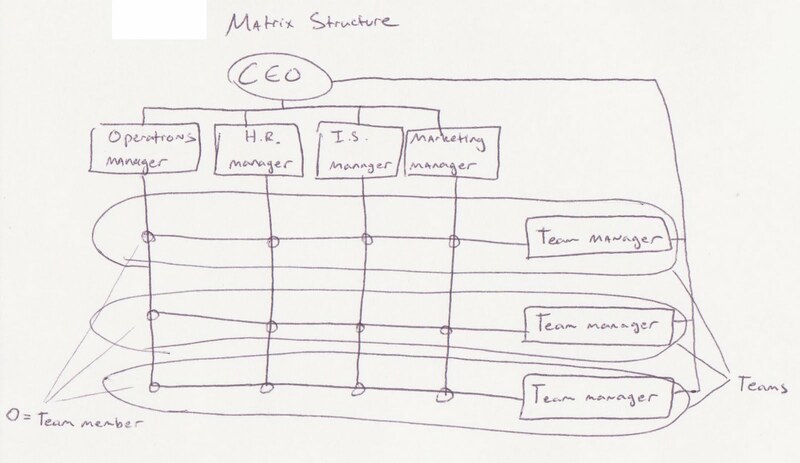 Like matrix structures, team organizations are hybrid structures, but with only one boss per person. They adapt well, and can handle complexity well. They are very costly to operate. There is often forced collaboration because teams are made up of multiple skill sets. People can easily move from project to project when they are needed, and this transient behavior helps transfer information throughout the company. The network organization is one which is almost exclusively made up of partnerships and outsourcing. 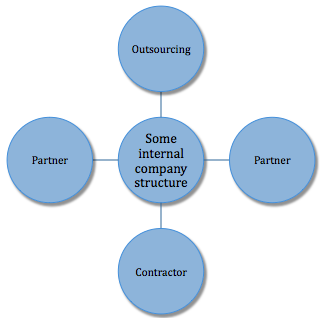 These partnerships and outsourcing contracts can easily be renewed, replaced, or removed. Sometimes called a virtual corporation, it can be accommodating but can also be a communications nightmare. Many online companies take this form. If a company wants to change its structure to fit its strategy, the company culture will probably determine whether the effort will succeed or fail. Often the level to which an organization can be organic will be determined by the self-motivation of its people and their ability to understand each other.